Rugby in Asia has traditionally been played by expatriates and their children, who for the most part have been male. 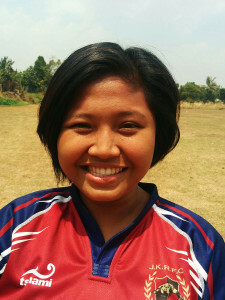 As part of its efforts to broaden participation in the game in and around Jakarta, the Jakarta Komodos Rugby Football Club (JKFRC) runs two programs that aim to introduce children from different backgrounds to the game they play in heaven. A group of young women from the Mama Sayang Orphanage in Jonggol, Bogor Regency, south of Jakarta, comprise the Komodos women’s team. Their participation grew from Indonesian Rugby’s association with the Priscilla Hall Memorial Foundation. Springing from a desire to give girls at the orphanage a chance to channel their sporting talents, the team now boasts 24 players, whose club fees, equipment and travel is paid for by the club. While the program has only been running for a few seasons, club coaches have seen a rapid development of skills among the core playing group. Moreover, the successful participation of the women’s team in local tournaments has seen player numbers grow to the point where a 15-a-side team will soon be a reality. Indonesian rugby stalwart Stephen Barber has now been joined by former Indonesian Rugby General Manager Aaron Meadows to form a coaching team that hopes the Mama Sayang girls will go on to form the core of an Indonesian women’s sevens team for the South East Asian Games and Olympic qualifiers. The Komodos commitment to the local community does not stop there. Last season, a group of youngsters from a school near the club’s Jagorawi training facility, began learning the basics of the game alongside more established junior players. This season, the original group of these talented boys have been integrated into the junior sides and more have followed, with numbers now swelling into the dozens. Whereas only boys were game enough to try out the sport in the first season, they have now been joined from a number of local girls keen to show their prowess. And this exciting new programme has been given a boost thanks to mining services company Britmindo, who have just announced they are sponsoring this initiative to the tune of US$4,000. Plans have also been discussed to expand the program to North Jakarta and South Jakarta. Club officials, parents, supporters and sponsors all realize the imperative to grow the game beyond the traditional catchment areas of international schools and families of those from other countries. Through this ongoing work to introduce young Indonesians to the joys of the game, it is hoped that not only will these children learn the core values of fair play, respect and physical fitness, but also that Indonesian Rugby will – some years down the track – reap the rewards of wider participation by becoming a regional rugby powerhouse. For us, rugby is unique. It is a sport that is unlike any other played in Indonesia. It is a very physical game that means you must be fit and conditioned to play. But that is what makes it so enjoyable. If you are fit and can take the occasional bump or scrape then you will love to play rugby. But it is more than just a game. For us it is a window into future possibilities. The rugby community in Indonesia is small but it is growing and offers unlimited potential for the future. This is good for the Komodos, for us, and for rugby in Indonesia. We look forward to traveling as much as possible this season, playing the game and sharing our passion. Thanks for all your support; we won’t let you down.